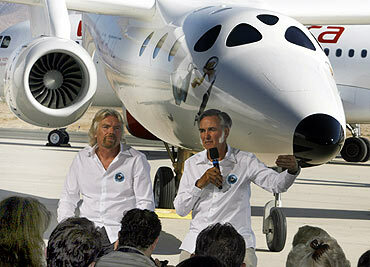 Rediff.com » Business » Images: Virgin SpaceShip2 makes first test flight! Images: Virgin SpaceShip2 makes first test flight! Virgin SpaceShip2 makes first test flight! The world is another step closer to space tourism now. You can book your place in space and join around 370 Virgin Galactic astronauts who will venture into space, soon. Tickets cost $200,000 and deposits start from $20,000. Image: The Virgin Galactic SpaceShip2 (VSS Enterprise) glides toward Earth on its first test flight after being released from its WhiteKnight2 (VMS Eve) mothership over Mojave, California, on October 10, 2010. The craft was piloted by engineer and test pilot Pete Siebold from Scaled Composites. Virgin Galactic, the US company developing the world's first commercial manned space flight system and tourism business, successfully completed the first piloted free flight of SpaceShipTwo, named the VSS Enterprise, on October 10. The spaceship was released from its mothership at an altitude of 45,000 ft. Image: The Virgin Galactic SpaceShip2 (VSS Enterprise) (bottom) is released at 46,000 feet (14,020 meters) from the WhiteKnight2 (VMS Eve) mothership (top), over Mojave, California. Photo taken with a camera through a high powered telescope. Virgin Galactic is now well on the way to becoming the world's first commercial space line with 370 customer deposits totalling $50 million. 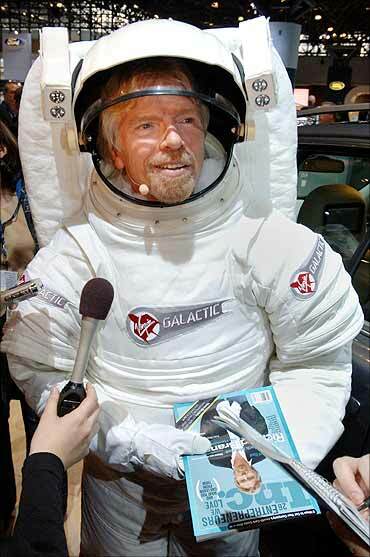 Sir Richard Branson, founder and chairman of the Virgin Group of Companies, talks to reporters after making a promotional appearance in a space suit for Volvo Cars of North America. 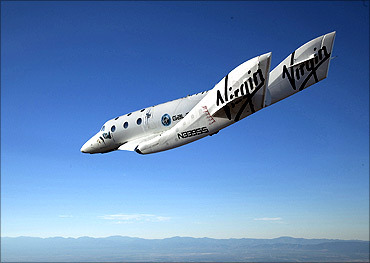 Image: Branson unveiled the winner of a sub-orbital flight to space on Sir Richard's Virgin Galactic. Branson was previously featured in a Volvo television commercial encouraging people to enter the contest for the trip. Future commercial operations will be at Spaceport America in New Mexico where final preparations are taking place for a finished runway inauguration ceremony on October 22. Image: Virgin Group's founder billionaire Richard Branson (L) and Burt Rutan, president of Scaled Composites, take questions from the media as they sit in front of Virgin Galactic's mothership WhiteKnightTwo during its public roll-out in Mojave, California. National Geographic channel in the United States will be showing a documentary on the build up and preparation for the first flight of VSS Enterprise on October 18. The programme would be later beamed in other nations too. 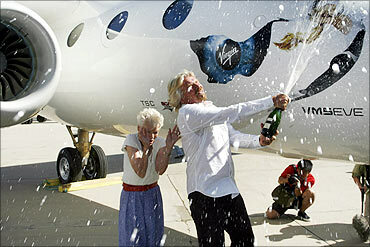 Image: Billionaire Richard Branson uncorks a bottle of champagne as he christens Virgin Galactic's mothership WhiteKnightTwo, Eve, in honour of his mother Eve Branson (L) during its public roll-out in Mojave, California on July 28, 2008. 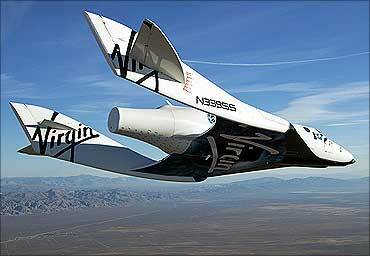 The twin fuselage aircraft WhiteKnightTwo will carry SpaceShipTwo to launch commercial passengers into space. 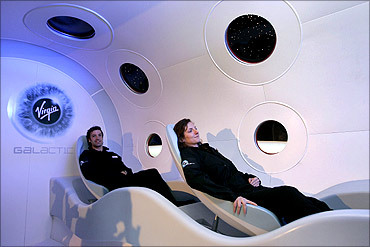 Image: A mock-up of the cabin of the Virgin Galactic Spaceship Two is seen on display at the Science Museum in London. Sir Richard Branson, founder of Virgin Group, who was present during the first successful flight, said: "This was one of the most exciting days in the whole history of Virgin. For the first time since we seriously began the project in 2004, I watched the world's first manned commercial spaceship landing on the runway at Mojave Air and Space Port and it was a great moment. Now, the sky is no longer the limit and we will begin the process of pushing beyond to the final frontier of space itself over the next year." 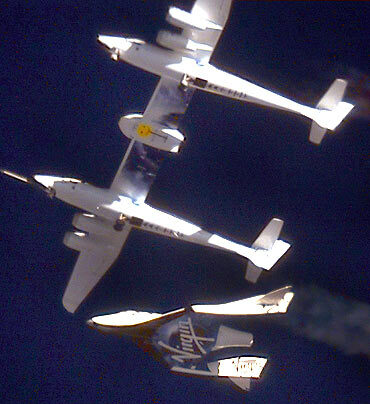 Image: The Virgin Galactic SpaceShip2 (VSS Enterprise) glides toward Earth on its first test flight.